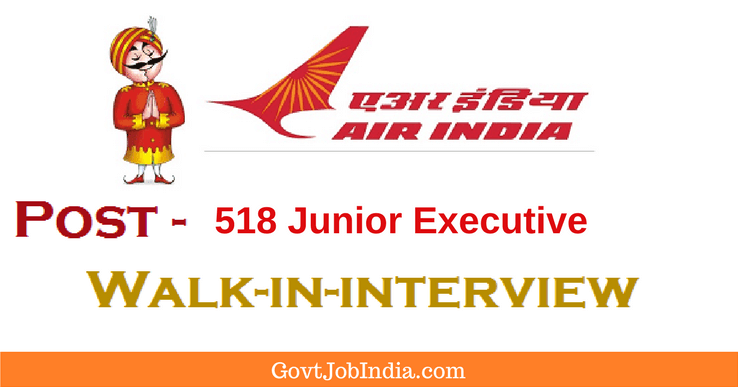 एयर इंडिया भर्ती – Air India recruitment 2018 has released latest recruitment notification for the posts of Junior Executive and other posts which comes up to 518 vacancies. This is an amazing opportunity for aspiring govt job seekers to make a career in a govt sector opportunity. Interested candidates need to apply on the application form which is available on the official site before the given last date. The latest govt jobs in India provide a sense of financial security to the public. If you are interested in securing the upcoming govt jobs in India, then this is your chance. If you are interested in the knowing the details of the latest Air India Recruitment 2018 like the eligibility criteria, age limit, how to apply, application fee, date of interview etc. are given below in great detail. We have also given the application form, so you can directly take a print out of this and fill it carefully and submit it during the walk in. PLEASE NOTE: Air India Air Transport Services Limited (AIATSL) is conducting a walk in for the selection of candidates. If the candidate gets selected, the candidate will be given a Fixed Term Contract for a period of three years for ground duties at Kannur Airport. The eligibility for each post in the Air India recruitment notification functions on a different level. So we have elicited information about each post in a comprehensive and clear way. So check out the tables for information for whichever post you want to apply for. The age limit required to qualify for the Air India recruitment 2018 is different according to different posts. The application fee for the General category is Rs. 500/- and the application fee for the reserved categories is Rs. 250/-. Candidates who are interested to apply for this recruitment notification must WALK IN- in person, to the venue on the given time and the given place with a duly filled application form. They also need to carry a recent colored, passport size photograph which should be pasted in the form neatly. Self-attested copies of supporting documents along with a photocopy of all the supporting documents. Candidates belonging to the reserved categories must bring a caste certificate along with their signed documents. These documents are absolutely necessary for the walk in and you must carry all of them when you go. PLEASE NOTE: You will have to take a print out of the application form and fill it duly when you go to the walk in. We hope this article helps solve your query for the search Air India Career. The Air India recruitment 2018 is an amazing opportunity for people to secure a govt job in Kerala. Govt jobs in airports are often widely looked for, and here is the perfect solution for it. So, if you found this article to be helpful, then definitely subscribe to our website by entering your email address and also bookmark us on your favorite browser. We will keep updating you with the latest and Upcoming information about Air India recruitment and other latest govt job vacancies which come up our way.